How to convert PowerPoint to video with music ? "Q: It is really amazing to see our lecturer to present his teaching in PPT-converted video with background music on it. How could he do that? Is there anybody who knows how to make a PowerPoint into a video with music?." "A: Lucky you. I have summarized several options for you to get the answer to how to convert PowerPoint to video with music. It is gonna be helpful. Keep reading. " Talking about the benefits of adding background music to a PowerPoint file, we have got tons to say. First, it significantly enhances the presentation effect if you put some music on the suitable slide and arouse audiences’ attention and resonance. To a large extent, music can be vital to the success of a PowerPoint. A piece of music can weigh more than a thousand words. All too often, pure PowerPoint slides are too plain to share, teach, or enjoy, so adding background music becomes necessary and popular. The best way to succeed in making PowerPoint as video with music is to take advantage with professional video converters to convert PowerPoint to video with music. 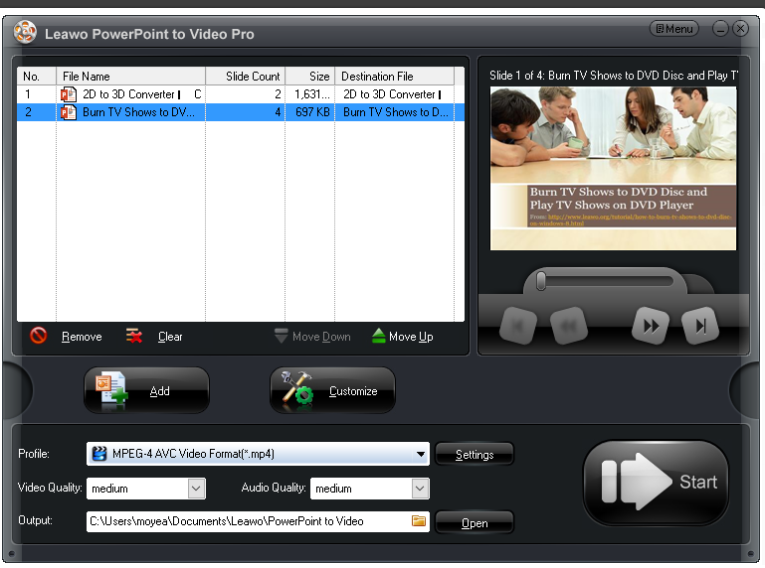 Upon the top in the rank of video converters, Leawo PowerPoint to Video Pro is worth your attention. This program is a professional PowerPoint to video converter, allowing users to convert any PowerPoint file to videos in various formats such as coverting PPT to MOV,MP4,ASF, AVI, FLV, MPEG, TS, WMV, VOB, 3GP, RM, RA, MKV, WEBM, MKA, Wii AVI, Wii MOV, etc. It retains all the animations, transitions, sounds and video clips in the source PowerPoint file. Apart from that, it provides a variety of video effects to the PowerPoint after conversion, like music, logo and so on. Step 1: Download and install the program to the computer. Click the below button to download the program to your computer and install it. Step 2: Add source files to the program. Click “Add” on the home page to import your source PowerPoint file to the program. Note that you can import them in batches. Choose the target output format from the “Profile” drop-down list. After that, set an output directory to save the file after conversion. Step 4: Add music to the background. Click “Customize” and the “Advanced settings” page will be shown. From this page you will see “Music” option under the “Presentation” tab. Click it and set the background music for the PowerPoint file. Step 5: (Optional) Add a logo to the file. If you like to add a logo to the file, click “Watermark” under the Presentation tab and set your own logo. Step 6: Convert PPT to video with music. After all settings are done, click “Start” to convert PPT to video. This video will be embedded with the background music you set in step 4. When the process comes to a stop, you can get your video fresh and new. 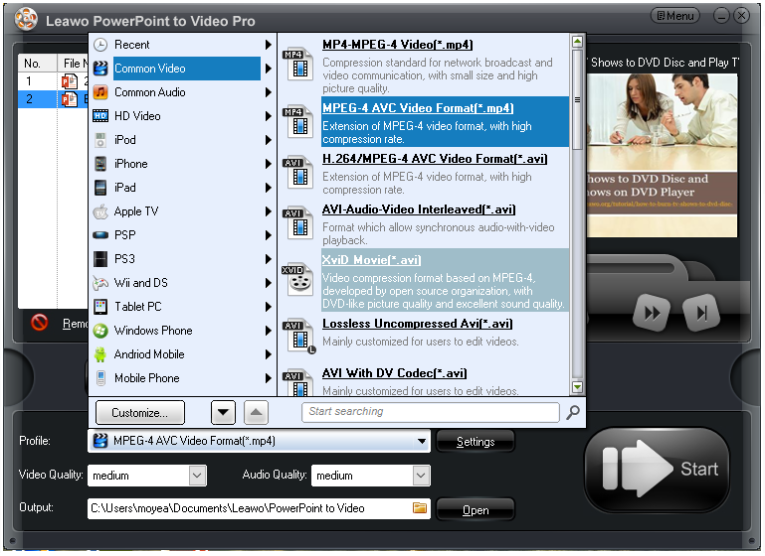 PowerVideoPoint Pro from Digital office Pro is an excellent conversion tool that helps in converting PowerPoint presentations to popular video formats. These steps are simple to follow when using this freeware to convert PowerPoint to video with music. Click “Add” presentations and follow the wizard to finish the conversion process. The Enable Video Narration function will allow you to add music to the slide but you need to make sure Web Camera and Microphone is connected right to the PC. When you play the music, it will be recorded in the PowerPoint. 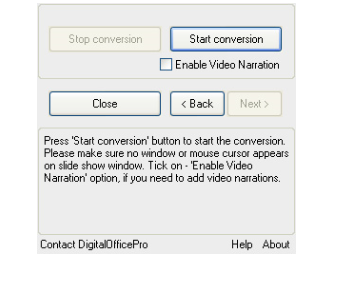 In the end, click “Start” conversion to convert PowerPoint to video with music. With RZ PowerPoint converter, we are able to easily convert any PowerPoint presentations to videos of any formats. After importing the source PowerPoint file to the program, you can press “Music” button to select any format audio files as new background musics of these PowerPoint presentations. Then click “Next” to proceed. Digital office pro and RZ soft are both freeware, which will be available online free. 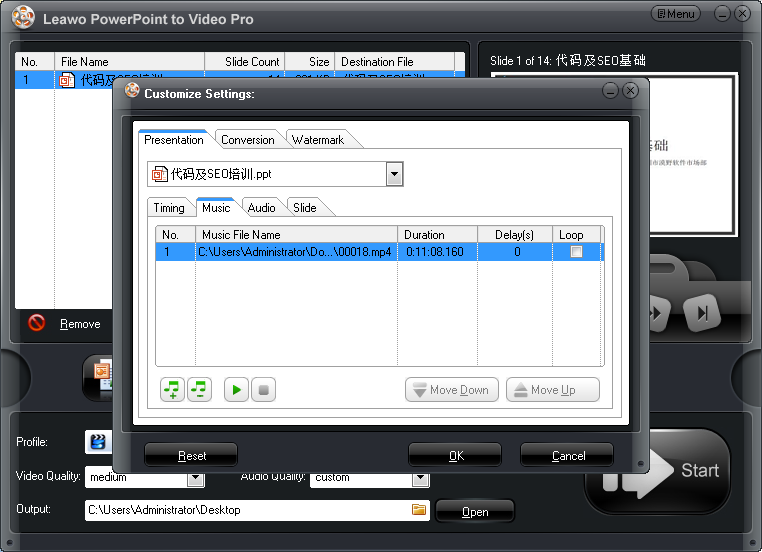 Digital office pro provides powervideopoint and it is a little bit complicated to operate especially for the feature setting such as adding music to the background. RZ PowerPoint convert has a relatively large simple user interface where users just need to click each icon to proceed with the conversion. Leawo PowerPoint to Video Pro is more user friendly thanks to the simple user interface, powerful feature settings, and professional PowerPoint conversion services. Above all, you can convert as many files as you like using this program. In a word, you can try the above three recommended programs to learn how to save PowerPoint as video with music and rate them in your own way.